Meg had her first softball game this morning. There will probably be a few dozen more. Her team won, not that that's what softball is all about but it's nice. Her second time up to bat she got a great hit. 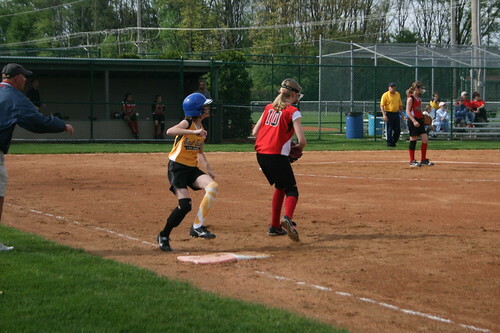 This is her running to first. She shouldn't really be looking at the ball but....she was. I missed the next bit of action. I believe she tried to steal and got tagged out. Maybe next time. I guess summer has officially begun? What are those girls wearing on their faces? Does everyone wear that while in the field, or just that pitcher and first baseman? I've never seen that. . . but I haven't been in the softball scene for many years. Just curious. Kelly, don't tell Richard my comment about winning. I'll never hear the end of it. The cages on the girls' faces are face masks. Lots of kids are wearing them now, especially those with braces or those who've been hit in the face with a ball. Some places it's mandatory. I don't think I could wear one. It would obstruct my vision. The girls seem to play fine with it.